Third in a three-part series on how to implement diversity in software engineering teams, by leaders at successful companies. Tasneem “Taz” Minadakis is an Engineering Manager at Uber, responsible for Rider Growth. The goal is to create magical experiences for new riders on the platform, which lead to riders using and recommending Uber to friends and family. Before Uber, Taz worked at JD Edwards in Denver, Microsoft in Seattle, then spent almost two years at Yelp managing Ad Delivery Platform. She holds a Bachelor’s degree in Computer Science from L.D. College of Engineering in India and a Masters in Computer Science from the University of Southern California. Diversity is important to building any engineering team. Diversity is not just about gender, but about background and experiences. Bringing in talent who’ve switched to coding after a few years in another role like a scientist, lawyer, or analyst can be a great way to bring this diverse talent to your organization. These candidates have the soft skills that are a must for any engineering role today as well as hunger to grow and learn new skills. To hire bootcamp graduates, there isn’t a recipe in my opinion. Each company is different and will need to find a process and structure that works best for them. But a few things do matter. First and foremost is willingness. The organization needs to be willing to acquire talent from non-traditional avenues like bootcamp programs. The next step is the recruiting process. At Yelp, we chose not to provide a higher monetary incentive for recruiting diverse candidates. We did hire graduates from diverse computer science programs. In addition, we also tried to recruit talent from bootcamp programs. Same is true at Uber. Through the recruiting process, it is important to pick the right interview panel that recognizes talent and potential. It is very natural for interviewers to compare bootcamp graduates against someone who has had a four year computer science degree with a few internships under their belt. It is important to have interviewers look for potential by reviewing their work done during the bootcamp project. I do not recommend altering the interview process, however it is important to evaluate based on how far the candidate has come through the formal training they received in a short window in time. Once you have hired someone, then it is important to provide them the support and training needed for them to thrive. Ensure that the new hire gets a mentor. I’d encourage having the mentor opt in. The amount of time, effort, and bandwidth they will need to provide these non-traditional candidates is very different from a computer science graduate from Berkeley or Waterloo. The mentor needs to be invested in the mentee in coaching them to be independent and valuable to the organization with time. 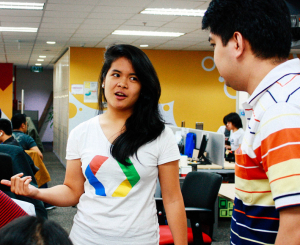 Mentees may need to train their mentors, too. The mentor-mentee relationship goes both ways. The mentors certainly have the knowledge and willingness, but might lack the training and structure to provide feedback that the mentee might need. By contrast, the candidates coming from bootcamp programs may have worked professionally in different industries in the past and have the maturity to handle constructive feedback. As a mentee, you will need to help your mentor help you. I have suggested creating a weekly goal setting exercise with your mentor or manager. Just like at the bootcamp, track your progress for the first couple months and ensure that you remove ambiguity in how your progress is being evaluated. Mentees: You need to own your mentorship, because you have the most to lose. The path to establishing yourself in an organization can be very steep for non-traditional candidates. The knowledge acquired at programs like Hackbright is a drop in the ocean relative to the skills needed to become productive in a professional setting. You have to trust in your ability to learn quickly as you will be thrown into a whirlwind in the first few months. On the leadership side, both mentors and managers need to provide the psychological safety that fosters learning. Bootcampers have communication, collaboration and leadership skills that will be valuable to the organization over time. But they also need time to acquire the technical knowledge needed to be productive. Once you have recruited and began mentoring this candidate, the next obvious question comes around evaluation. I have personally asked myself this question and I don’t have a real good answer. But I recommend you ask yourself and your leadership on how should you evaluate a bootcamper within the first 3 months of being on the job? Should they be evaluated just the same as your computer science graduate from Berkeley or Waterloo? If so, is it a bar that is too high to be met? If not, then why not? All in all, broadening your hiring to turn diverse graduates into valuable employees means focusing on achieving results, rather than standardizing the process. I am not sure of a formula that can work for every manager out there. But it is important to be open to the idea, be flexible in your recruiting and training process and be fair when evaluating their progress. What matters is not where they are from, but what they can do. Missed the first two parts? Read Diversity Part I: How To Strip Gender Bias From Hiring and Diversity Part II: How To Retain Your Employees. Interested in hiring brilliant bootcamp grads? Our women software engineers go through a rigorous and immersive 12-week software engineering fellowship. Learn more about how to partner with Hackbright Academy to hire your next software engineers.